Deep within the well of Skingrad Castle Courtyard, the next Drop matches killer against killer. Retrieve the next contract from inside the Skingrad Castle Courtyard well. Locate J'Ghasta in Bruma and eliminate him. Move to the next contract at the Old Bridge landmark. Your target is J'Ghasta, a very skilled Khajiit boxer in the city of Bruma. The dead drop states that he is expecting you, and has bribed the guards to ignore the fight if it spills out onto the streets. J'Ghasta can be found in the secret training room in his basement. The entrance is a hatch hidden with several rolls of cloth. If you're having trouble finding it, use the local map, which will show you the door's location. J'Ghasta will confront you when you approach him and tell you to leave. Picking any of the three responses will provoke his aggression, and the battle will begin. Despite being unarmed, his attacks do heavy damage to your health and fatigue, so keep an eye on both of these when fighting him. Consider waiting until he goes to sleep between midnight and 5am to approach him, as the well-lit room makes sneak attacks difficult at any other time. Before you leave, you may want to pick up a Black Hand Hood and Black Hand Robe, both in a keg on the lower floor protected by a very hard lock, and two Hand to Hand skill books: Ahzirr Traajijazeri on a desk in the basement and Immortal Blood on the bottom shelf of the bookshelf on the upper floor. Once you are finished, go to the Old Bridge south of the Imperial City. The next dead drop is waiting for you below it, along with your payment. You may notice that the dead drop orders are written with different handwriting and the note icon looks different than the first two. This turns out to have significance later on. Rarely, after killing J'Ghasta, the "rotten box" will not appear under the bridge. You can fix this problem by putting prid 191F4 followed by enable into the console. This will manually activate the rotten box and allow quest progression. 10 I have picked up my next contract from the dead drop in the Castle Skingrad well. I have been ordered to kill the Khajiit J'Ghasta, who can be found at his house in Bruma. J'Ghasta is a master of unarmed combat, and will prove a challenging opponent. 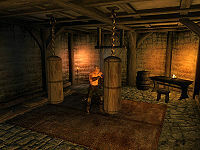 I should also be aware that J'Ghasta is expecting trouble, and has paid off the guards to look the other way if our fight spills out into the city streets. 20 J'Ghasta is dead. I must pick up my reward and next contract at the dead drop located in the rotten box under the Old Bridge, just south of the Imperial City. It is possible to use the console to advance through the quest by entering setstage Dark12Harem stage, where stage is the number of the stage you wish to complete. It is not possible to un-complete (i.e. go back) quest stages. See SetStage for more information. Esta página foi modificada pela última vez à(s) 23h56min de 1 de maio de 2015.